This morning, our last in Beijing, we had a tour of one of the city’s hutongs, old neighborhoods of alleyways lined by courtyard houses as well as businesses. Many of the hutongs have been demolished to make way for condos and office buildings, but a few are being preserved as a way to safeguard part of Beijing’s cultural heritage. 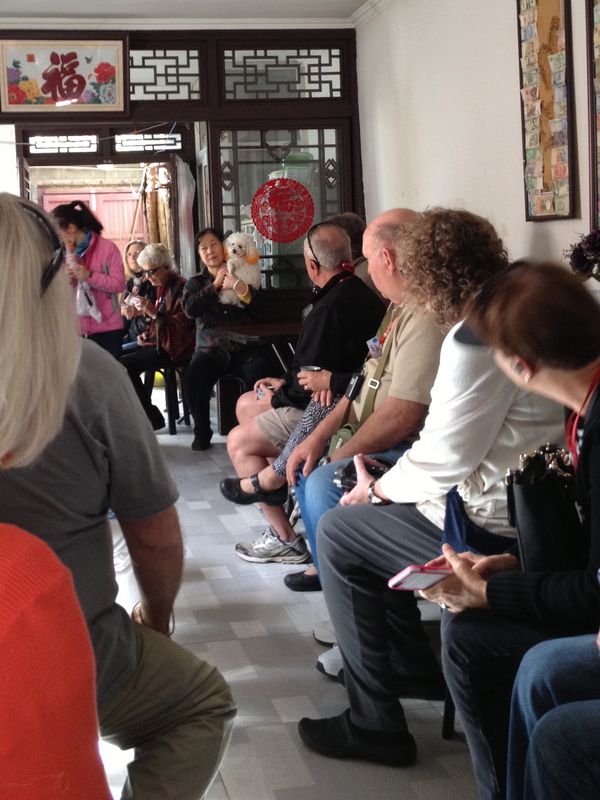 Our tour group crowds into a small hutong house. The owner is holding the dog. Some of the glasswork, which is painted on the inside. After our ride, we visited one of the hutong houses. The house was quite small, consisting of three rooms in a line, plus a small kitchen next to the entry hall. In addition to the entry, there was a living room and a room at the back that doubled as a workroom and bedroom. There was no bathroom; a bath house is down the street. The house is actually about one-fourth of the original home. The owner was forced to give up most of the house during Mao’s time. Our tour group was barely able to fit into the space. 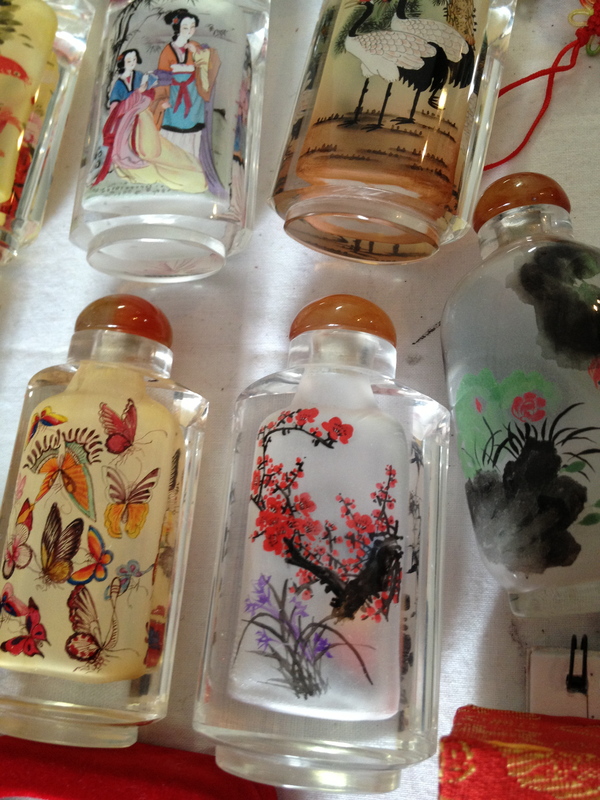 The woman who lives there makes painted glass bottles with the help of her niece. The glass is painted on the inside, in reverse, which makes it a challenging art. The glasswork was for sale, of course. We are learning that today’s capitalist China always offers tourists opportunities to buy. 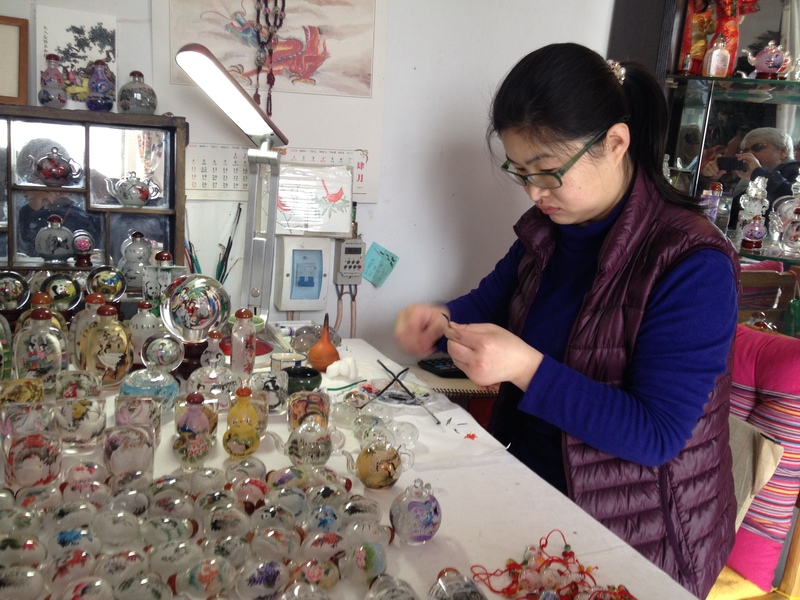 The owner’s niece works on the painted glass. Visiting the hutong was a nice counterpoint to the modern Beijing that we had experienced for the last few days. Beijing had seemed to be mostly high-rise condo buildings and traffic. I decided that the city is kind of a cross between Washington, D.C., and Los Angeles, In Tiananmen Square and the Forbidden City, it has a monumental core like Washington’s, but it also has urban sprawl like Los Angeles. In fact, at almost 6,500 square miles, Beijing is 13 times the size of Los Angeles. After the home visit we went to a tea ceremony, where a sprightly young woman demonstrated the proper way to make Chinese tea (no tea bags; that’s the lazy way), and we were able to taste several different varieties. After the tea ceremony, there was, of course, an opportunity to buy tea and tea-making equipment. 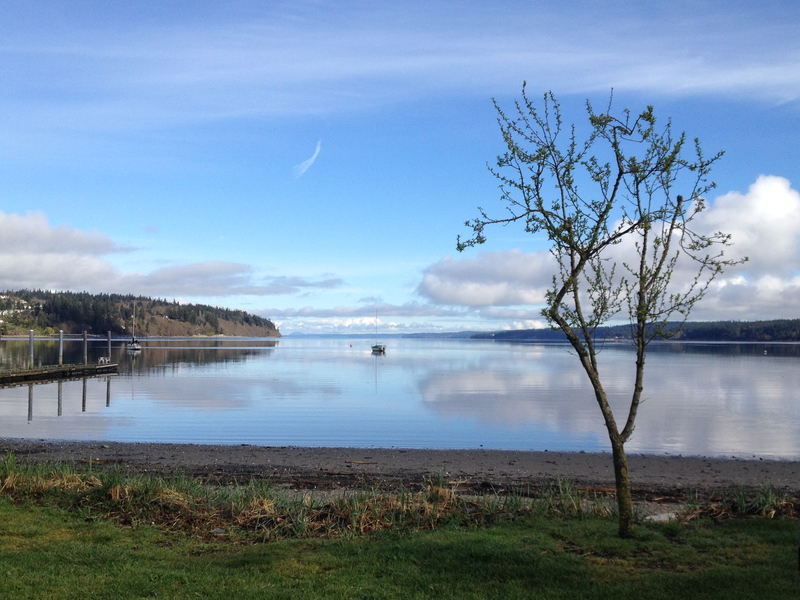 Mellowed out by the tea, we boarded our bus to head for the airport. Then Matthew’s phone rang. It seemed that our flight to Xi’an had been canceled, due to mechanical difficulties. We ended up sitting around the Beijing airport for four hours. Ultimately we were split into two groups taking two different flights. We did not arrive in Xi’an until about 7, tired and a little grumpy. Still, it was nice to have Matthew and his cohorts to deal with the canceled flight. I found it hard to imagine dealing with it on our own. 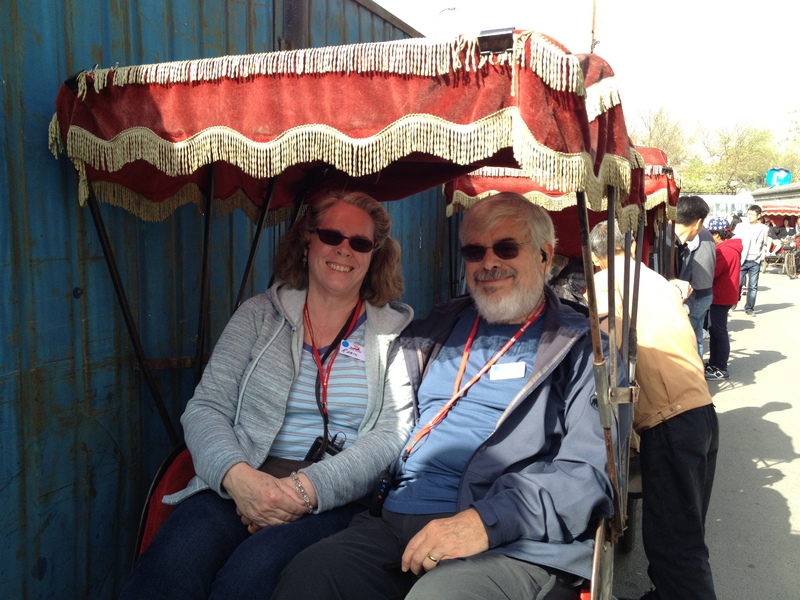 John and I took the Viking Cruise approach to China travel in Sept. 2013. One of our flights was “delayed” several hours because our tour group was stuck in traffic trying to get to the airport. When we boarded the plane, the looks on the faces of the other passengers who had been stuck there waiting for us spoke volumes.